You’re super motivated, you even buy some new workout clothes as 2016 is gonna be your year. WAIT – are you destined to fail by making any of these simple mistakes, which will halt your progress quicker than you can say bah humbug. Everyone knows that to lose weight you need to cut some calories, but drastically starving yourself can have the opposite effect. Sure you might lose some weight but it will most likely be from your lean muscle. Losing lean muscle will actually leave you looking worse, you will still have that jiggly feeling and lose your muscle tone. Instead you want to make sure you are eating enough to fuel your training (especially protein). Eating enough will keep you feeling good and make sure that any weight loss comes from your body melting away your fat aka your jiggly bits. It’s pretty difficult to overeat good, healthy nutritious foods but for some reason when we start exercising we get into our heads that it’s a licence for us to pig out (I’ve worked hard I deserve it you say). 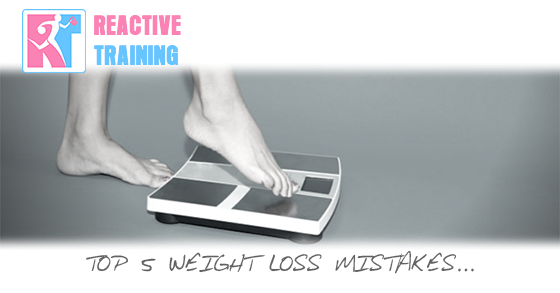 Starting an exercise programme is not a reason to reward yourself with treats, especially food. It’s even more important that while training you refuel the body with healthy nutritious food to help recovery and promote fat loss. Just like your food, more is not always better. Your training will ALWAYS be limited by your recovery rate, and doing more and more creates additional stress on your body. A few things will happen, you can have a similar scenario to under eating and end up skinny fat, get unwell or injured which puts the brakes on your new found regime. It’s about training SMART, my recommendations would be 3-4 sessions of strength type training per week for most women. If you want to do more then add in some low intensity walks which will aid recovery and help fat loss. *Note it is possible to do too much walking, especially if you’re coming from being a couch potato. Start slow and build up your walks aim for 1-2 hours a week accumulated. I get it you’re scared of lifting weights, you feel a bit intimidated and don’t really know what you’re doing. So you decide to do lots of classes, but are still not getting anywhere. Too many classes will lead to you becoming efficient (you need to be inefficient for better results), just like undereating and too much exercise can lead to you becoming skinny fat. Lifting weights will get you strong (body pump is NOT lifting weights), preserve lean muscle and keep you looking lean, toned and like a godess. (you will not get big and muscly). Honestly it’s not that scary and can even be good fun, I recommend finding someone who can teach you how to do it properly. We have women older than my Mum lifting their body weight, and doing more than most guys you see in commercial gyms with much better form. They also look about 10 years younger and move better than most youths of today. As previously touched on, your results will always be limited by how quickly you can recover. If you have the nutrition just right, your training is on point but you’re burning the candle at both ends with late nights and early mornings then your recovery will be affected. You should be aiming to always be in bed before midnight, every hour before 12 counts as 2 in terms of recovery. That means if you go to bed for 10 you gain 4 hours in terms of recovery. Aim for 7-8 hours minimum quality sleep per night, by quality I mean are you restless, waking up or struggling to sleep? If so there’s lots of strategies you can put in place, I’ve had clients get their results back on track just by sorting their night time routine. CLICK HERE TO SIGN UP FOR GROUP PERSONAL TRAINING!! !